The first half of the 2016-17 season has challenged the Stars’ resolve in many ways. First, they disappointed compared to expectations. After last season, it appeared the Stars came close to the Conference Final, now less than a year later, they cling to playoff relevance. Next, came the endless list of injuries, which have been well documented. Through 43 games they had a whopping 195 man games lost to injury. Only Detroit, Edmonton and Buffalo had more man games lost. Finally, the only consistency in the Stars’ game has been inconsistency. At the midpoint of the season, the Stars’ record was 17-16-8. The 42-point start left the Stars sitting just outside of a wild card position. Their prolific offense, which led the league in goals (267) last season, sat a mediocre 17th with 109 goals scored through 41 games. Without further ado, let’s assess the midseason grades. 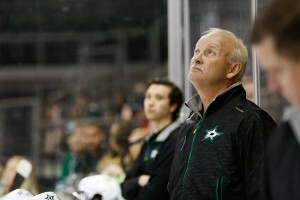 Part I will focus on management, coaching, and the Stars’ forwards. Stay tuned for part II which will feature the midseason grades of the Stars’ defense and goaltending. Note: SAT references were based on 5×5 play. Nill’s biggest accomplishment was signing captain Jamie Benn to a long-term deal this summer. He also re-signed Patrick Eaves and brought in veteran forwards Jiri Hudler, Laurie Korpikoski, Adam Cracknell and defenseman Dan Hamhuis. 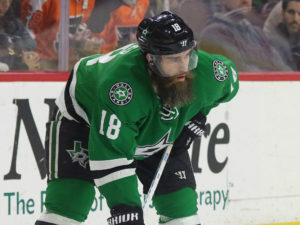 He let solid veteran center Vern Fiddler walk and opted not to bring back forward Colton Sceviour or veteran defensemen Alex Goligoski, Jason Demers and Kris Russell. He failed to address a weak, ageing and expensive goaltending situation. Ruff has kept an even keel despite mixed results and injury problems. Ruff has tried mixing up different forward combinations and defense pairs but hasn’t found the right recipe for success. He’s played the hot hand between the pipes, but the goalies have been inconsistent. He’s been the voice behind the bench for four seasons now. The Stars’ results simply weren’t good enough through 41 games. Benn had surgery in the offseason to repair a core muscle injury. This affected his preparation for the season. As the season started, he then needed time to shake the rust off. He was starting to find his game when an ankle injury led to another setback. Surprising stat: Only four even strength goals in 38 games. Seguin also started the season slowly while recovering from a lower-body injury at the World Cup. Despite that, Seguin led the Stars in points (39), power-play points (15) and co-led in goals (14) through the first 41 games. He continues to produce positive results with a 50.7% faceoff win percentage. Furthermore, he’s the Stars’ lone All-Star representative this season. Surprising stat: Tied for fourth in the league in shots that missed the net (63). Spezza was second among Stars forwards in SAT (52.04%) but owns a team worst minus-11 rating. He was also third on the team in scoring (24 points) but only had one power play goal. He’s been excellent in the faceoff circle with a 52.8% FOW. Surprising stat: Ranks 740th out of 785 NHL players with 0.2 hits per game. Eaves was tied for the team lead in goals (14) and led in power play goals (8). He was third among forwards with a 51.83% SAT. He has been surprisingly resilient this season missing only one game while also producing consistent results. Surprising stat: Only Pittsburgh’s Sidney Crosby and Columbus’ Cam Atkinson had more power play goals. Roussel was one of two Stars forwards who averaged at least 24 shifts per game and had a positive plus/minus rating. Roussel had two game-winning goals. He was also tied for fifth among forwards in points (17). He led in penalty minutes and also led the Stars with seven fighting majors. Surprising stat: He led Stars forwards in SAT 54.26%. The rookie, a former University of Maine product, has shown flashes of high-end skill, yet has struggled to find consistency. He had a plus-one rating while only scoring four even-strength goals in 41 games. His 43.25% SAT ranked last among Stars forwards. Surprising stat: Ranked second among Stars forwards with 35 blocked shots. Faksa was a late-blooming rookie surprise last season. Injuries have put more on his plate this season. He has taken over 250 more faceoffs than any other Stars player. However, his faceoff win percentage was poor (46.6%). He averaged more than a hit and blocked shot per game. Tied with Roussel for fifth among Stars forwards in scoring. Surprising stat: Second highest plus/minus rating (plus-six) among Stars forwards. Nill signed the veteran journeyman in the offseason to add depth. He hasn’t had a lot of offensive production with just 14 points. He has been a positive plus/minus (plus-four) contributor but also was next to last in SAT (44.89%) among Stars forwards. Surprising stat: All 20 of his missed shots were wide (19) or hit the post (once). He didn’t have any shots miss high or hit the cross-bar. Only Seguin, Eaves and Benn had more goals than Ritchie’s eight. Ritchie has been productive despite limited ice time (12;53). He led all forwards in hits with 74. He had a positive plus/minus (plus-four) and ranked seventh among Stars forwards with a 49.88% SAT. Surprising stat: Wrist shots have accounted for seven of his eight goals. If Brett Ritchie ever starts finishing on a consistant basis, he could be a 40 goal player. This guy wasn’t even expected to make the team, and he led all Stars forwards in plus/minus (plus-eight). He produced little offense with just six points in 37 games but did have two game-winning goals. He had a good faceoff win percentage (51.5%) while anchoring the Stars’ fourth line. Surprising stat: Had a total of two penalty minutes in 37 games. McKenzie appeared in 28 games and produced eight points. He averaged just under two hits per game and was second among Stars forwards in penalty minutes (42). He had the second most fighting majors with four. He was a positive plus/minus contributor (plus-three). Surprising stat: His 43 shots on goal were just one behind Antoine Roussel. The following players get Incomplete grades for failing to appear in at least 25 games in the first half of the season: Mattias Janmark, Ales Hemsky, Cody Eakin, Jiri Hudler and Patrick Sharp.